Often while designing business solutions for a client application, one needs to represent the workflow and count on it over the lifecycle of the project. Business decisions, Roles and Technical aspects of the project are laid out in this workflow. Thus, it is vital that the workflow is prepared using an accurate approach. Out of the numerous methods, most of the time it comes down to using either Flowchart or a BPMN. Flowcharts are a graphical representation of different characteristics of a system and evolved out of a notation system developed in the 1920’s without strict standards. BPMN stands for Business Process Modelling Notation and is currently in version 2.0. It is a standards based approach to graphical representation for specifying business processes along with illustration of other tiers of the system. In this example support system workflow, our objects are Cases, Case Managers, Technicians, response time process and client communication (feedback process). BPMN provides a standard set of shapes & symbols, that with some study, will be well understood by all viewers. In our example, flow objects like message start events, user tasks, and events are especially useful when compared to just using process (rectangular), manual input (quadrilateral) or conditional (hexagonal) shapes in a flowchart. BPMN has evolved the simple concept of a flowchart decision block into different types of gateways (shapes). These have been used in the support system example for the response time & communication process. For instance, if there is no response on a case for 10 minutes after it is created then an email is triggered to the Case manager. Since BPMN is a standard, it can be used by companies to plot their business process in a visual language that can be understood by all parties without misinterpretation. Initially, BPMN may have a steeper learning curve but once an organization adopts the standard the learning accelerates as users gain a common language to visually express how work gets done. If you are struggling with ad hoc Flowchart-based diagrams to answer these types of questions, try BMPN instead. The amount of detailing in a process is always directly proportional to the level of the difficulty needed to build it. 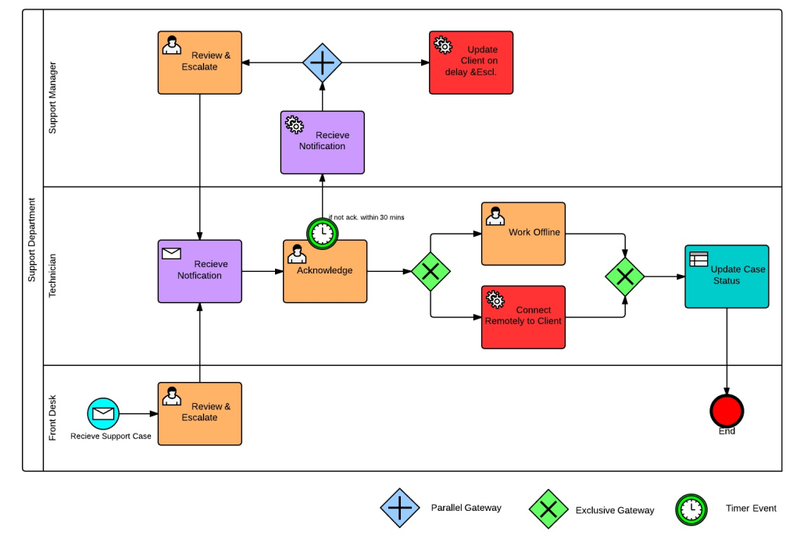 BPMN provides more details than a flowchart when it comes to defining processes. Do you need help with your business processes? The MCFTech team is here for you!